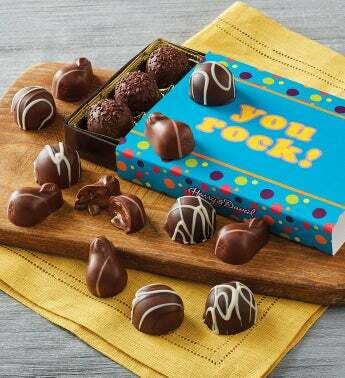 Make someone smile with a thoughtful gift of delectable chocolates. Inside a cheerful gift box, they'll find dulce de leche, dark chocolate raspberry, double chocolate, and dark chocolate truffles. Expertly crafted in our candy kitchen with our signature chocolate recipe, these indulgent sweets are always a welcome surprise.